Laws and guidance notes are rarely retrospective as this would go against fairness and justice. As regards laws such as the Treasure Act 1996 and guidance notes dealing with human remains and archaeological excavation, however, many archaeologists, Anglo-Saxon specialists and museum curators probably wish that they could be. Hansons Auctioneers recently announced it would be selling by private treaty a collection of 250 objects recovered from excavations which started in 1962. The excavations were initiated by Gordon Taylor who found a bone fragment while out walking in the parish of Irby-on-Humber, Lincolnshire. This chance find led him to uncover an important Anglo-Saxon burial site spanning over 200 years, now known as Welbeck Hill. Taylor led the excavations over the next 17 years and the discovery made national headlines and attracted the attention of scholars and archaeologists. The excavations uncovered skeletal remains, jewellery including a gilded square-headed brooch, girdle-hangers and tweezers as well as countless pottery artefacts. Although not an archaeologist by training, Taylor taught himself how to excavate and record. He passed away two years ago and his collection is now being sold by his widow, together with the notebooks and drawings Taylor created during the excavation, and the photographs he took. Mrs Taylor would like the collection to stay together and hopes it will be bought by a museum. Bids are invited up to 1st June and the asking price is between £50,000 and £80,000. This sale raises many interesting issues on both moral and academic levels. Many archaeologists object to the monetisation of archaeological finds. Primarily, this is because the removal of these objects from the public domain and the loss of the information they can reveal is considered to undermine the very purpose of archaeology, being to learn from our past by studying it. Secondly, many archaeologists believe that the selling of archaeological objects encourages looting – if dishonest individuals know there is a ready market for such finds then they are more likely to go and look for them. Last year, the storage facility of Canterbury Archaeological Trust was burgled and hundreds of items were taken, some replicas but others, authentic pieces. Many finds huts on excavation sites have had to have CCTV and other protective measures installed. Nighthawks are a big problem in many rural areas, and while there are many honest metal detectorists there are undeniably some dishonest ones too. Despite improvements in methods of tracking and filtering the sale of illicit archaeological finds there are always some that slip through the net. Particularly complex and sensitive issues arise when finds include human remains. From a legal perspective, the archaeological excavation of human remains is strictly controlled, and a licence must be obtained from the Secretary of State and the Church of England, in some cases, before the excavation begins; furthermore, the remains may have to be reinterred. This is further complicated by the fact that the sale of human remains is not always forbidden. Whilst guidance is available for the museum sector about the care of the remains, when it comes to the issue of their sale in the private sector, there is little regulation or guidelines for dealers and auction houses to follow. The Treasure Act did not exist when Gordon Taylor made his discovery; instead finds were then governed by the law of treasure trove. In a nutshell, this common law concept stated that items of precious metal that were buried with the intention of eventually being recovered were the property of the Crown. As the items in Taylor’s case were all burial goods they were never intended to be recovered, and thus fell outside of that definition. This was also the case with the famous discoveries at Sutton Hoo, which the finder ultimately donated to the British Museum. While Mrs Taylor would like the collection to remain intact and be bought by a museum, many museums are under pressure financially and often struggle to raise the necessary funds. Hopefully that will not be the case here, and a museum will succeed in acquiring this collection which can then go on public view, available to researchers and the public alike. 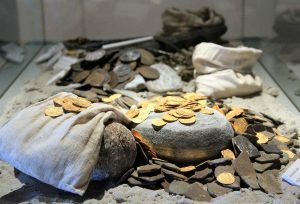 The current consultation on the Treasure Act will hopefully raise the profile of this whole area of law, encouraging much-needed consideration of issues such as the complex definitions of treasure, the ability of museums to acquire objects declared to be treasure as well as the system for rewards. As noted in our recent post, the IAL is currently preparing its response to the consultation. For those enrolled on the IAL’s Diploma in Art Profession Law and Ethics course, the law of treasure in the UK will be covered on the session of 1 July 2019.